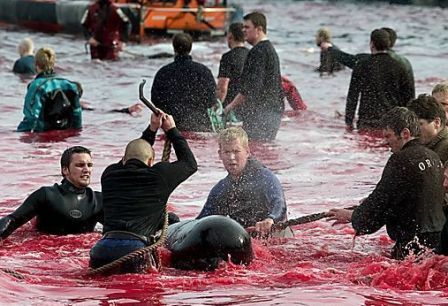 An average of 700 pilot whales and dolphins or more are slaughtered in the Faroe Islands every year. Entire family groups of whales, known as pods, are driven ashore and killed using hooks and knives. The whale hunt, or grind as it is known, has been conducted for centuries. It once provided important food for the Faroese population, but today it is little more than an inherently cruel tradition that produces meat and blubber that Faroese health leaders have warned is no longer safe to eat because of the toxic pollutants that concentrate in the whales. In 2013, 1,104 pilot whales and 430 dolphins were driven ashore, gaffed with steel hooks and dragged into the shallows to be killed with knives and lances. Entire pods of whales were killed: pregnant whales, mothers and their calves, none were spared a terrifying and for many an agonising death. The meat and blubber was distributed for public consumption, and is even on sale in bars, even though Medical Officers have warned it is unsafe to eat because of the toxic pollutants it contains, such as mercury. WARNING: The film below shows news footage containing graphic images of whales slaughtered in a grind at Klaksvik, the Faroe Islands, in June 2010. Although the commentary is not in English the footage reveals the horrific reality and cruelty of whaling in the Faroes that continues to this day! The pilot whale hunt has origins dating back centuries when the meat and blubber provided a valuable source of animal protein in the Faroese diet and whale oil became a significant export as well as being used for cooking and lighting. Even the offal and skeleton was utilised for animal feed and fertiliser. However, the hunt no longer provides essential protein for the Islanders, who enjoy a high standard of living derived from fisheries exports to Europe and the USA. In fact, the Faroese economy is over 90% dependent on fisheries. Faroese government officials have said they want to kill whales commercially and it is no coincidence that Denmark, which also defends the ‘subsistence hunting of endangered whales in its other dependency of Greenland, is backing the resumption of commercial whaling at the International Whaling Commission (IWC). Denmark’s position is held in open defiance of the rest of the European Union which is opposed to the commercial hunting of whales. Pilot whales are toothed whales around 20-25 feet in length and can weigh up to five tons. They are highly vocal, social animals swimming in groups called schools or pods, that can number in the hundreds. Pilot whales use echolocation to navigate and hunt for squid their principal prey. Often, entire schools of pilot whales will beach themselves and eventually die. It is not known whether such mass-stranding events are navigational errors by the whales or deliberate acts to help sick or injured group members at risk from drowning. Although still considered common pilot whales are at risk from marine pollution, over-fishing of squid and fish-stocks, entanglement in fishnets, and whaling. 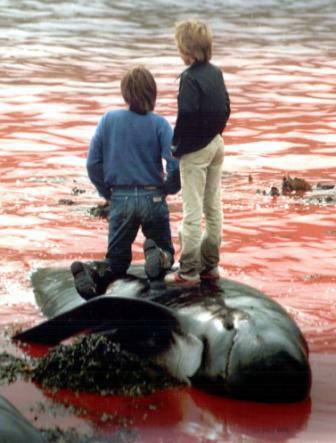 On 26 November 2008, the Chief Medical Officer in the Faroes, Dr Høgni Debes Joensen, together with Dr Pál Weihe of the Department of Public and Occupational Health, issued a joint press statement with a recommendation that the meat and blubber of pilot whales was no longer fit for human consumption because of the high levels of mercury and other toxins that accumulate in the meat and organs of the whales and a comparatively high incidence of Parkinson’s disease, diabetes and other serious health issues in the Faroes linked to these contaminants. The Faroes Food and Veterinary Agency has recently recommended that consumption of whale meat be limited to no more than once a month, with women advised to avoid it altogether if they plan to have children or are pregnant or breast-feeding. These toxins are also known to harm the nervous and imune system development of children. This is because of the toxic contaminants that accumulate in the whales bodies through the food chain. These contaminants include mercury in the flesh, liver and kidneys and polychlorinated-biphenyls (PCB’s) in the blubber. PCB’s are highly toxic industrial compounds linked to damage to the immune system and reproductive failure. Although subject to a voluntary manufacturing ban since 1977, some countries still produce them (see our environmental briefing section for further in information). Campaign Whale has called upon the International Whaling Commission (IWC) to collaborate with the UN World Health Organisation (WHO) to investigate the serious health threats to people that eat whale products that are increasingly contaminated with dangerous levels of toxic pollutants that accumulate in the whales through the food chain. Campaign Whale is opposed to the slaughter of pilot whales and dolphins in the Faroe Islands because this whaling is unacceptably cruel, the whale meat is no longer an essential food source and is dangerously polluted with toxic pollutants hazardous to human health. The whale hunts are also a threat to the whale and dolphin populations targeted whose size and status is uncertain and already under mounting threat from climate change, toxic pollution, over-fishing, entanglement in fishing gears, hunting, ship-strikes and disturbance from oil and gas extraction, seismic surveys, boat traffic and lethal military sonar. The combined impact of these threats is quite simply unknown, but potentially catastrophic. Campaign Whale has visited the Faroe Islands on four occasions over the last year, meeting with government officials, public health leaders, local people and the whalers themselves. We were also able to attend the annual meeting of the International Whaling Commission (IWC) in Panama City in June 2012 where we helped pass a resolution calling on member governments to responsibly inform the public about the health risks from eating contaminated whale meat and blubber. Our campaign has helped maintain a public debate over the future of whaling in the Faroes and in September 2012, Campaign Director Andy Ottaway returned to the Islands to meet with Faroese nationals that have spoken out against the grind for the first time. We are working with our Faroese contacts to keep the whaling debate going and we are pleased to report that, as a result, opposition to whaling is growing while consumption of whale meat has fallen significantly. A situation where the future of whaling is even questioned is quite unprecedented. It provides us with a truly unique opportunity to turn the tide in favour of the whales, as well as averting an unfolding public health disaster in the Faroes caused from the traditional consumption of increasingly polluted whale meat and blubber. An important part of our strategy is to inform the debate over whaling and to change public attitudes toward the whales. Most of all, we want to educate the public about what wonderful, intelligent and sentient creatures these animals are, and most importantly, their capacity to suffer. Please help our campaign! To read all the latest campaign updates please click here to visit the Campaign Whale News section.